Talk about eating your greens… there’s nothing like algae. These are the plants with the highest levels of chlorophyll, so they color the puree a fresh green. Chlorella powder is very easy to use in the kitchen. 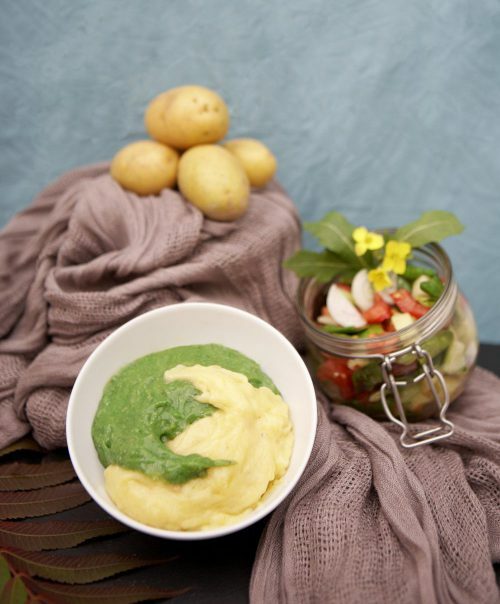 When cooking mashed potato, simply mix in 1 to 2 teaspoons of Chlorella until you get the green color you want. The Chlorella only needs to be added to the dish at the end of the cooking process. This lets the puree take on not only the fresh green color of the Chlorella but also its gentle grassy taste. Two-colored food is an absolute eye-catcher and it is well known that attractive food seems to taste better. Instead of adding Chlorella to the whole amount, you can first divide the mashed potato into two portions and then only add Chlorella powder to one of the two. Other foods such as pasta or couscous can also be colored simply with Chlorella.